If you’ve graduated in the last ten years, chances are you would have encountered Noel Wagg. He is one of the University’s most committed alumni volunteers, with almost a decade of volunteering at graduation ceremonies under his belt. This year is the 10th anniversary of our graduation volunteers. At this year’s April graduation series, it’s estimated that Noel will be volunteering at his 252nd graduation ceremony, and will have seen 40,000 students graduate. This will be his 17th graduation series since he first started volunteering at graduation in 2011. Noel qualified with a Bachelor degree in Earth Sciences (Geology) from Macquarie University in 1977. He worked for ACT Education in Canberra for over 30 years from 1972-2002 as an Executive Officer. In 1979 he participated in a 12 months Commonwealth Teacher Exchange Fellowship Program which took him to Wales in the United Kingdom. In 1992 he received an American Host Foundation Scholarship. Since retiring in 2002, he has generously donated his time as a volunteer in a number of areas including being a “vollie” at the 2000 Sydney Olympics, and helping the Red Cross in Canberra by volunteering at the Oncology Ward at the Calvary Hospital. 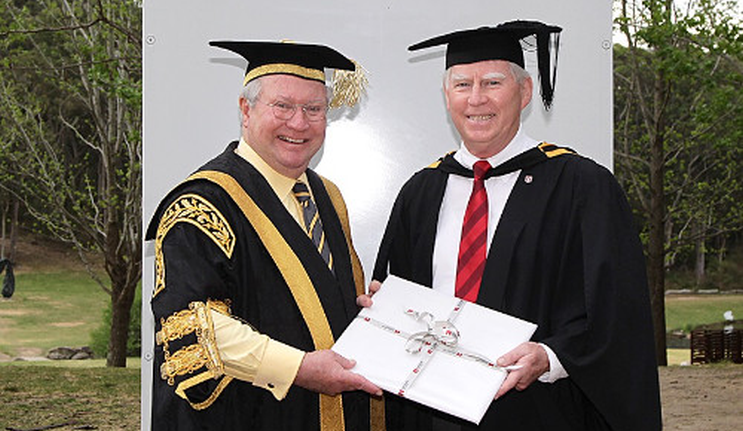 He has contributed his time over many years to Macquarie University, not just as a volunteer at graduation ceremonies, but also serving as an alumni member of the scholarship selection panel for alumni scholarships. In more recent years he has stood on the stage and briefed every Macquarie University graduand on the graduation procedure prior to every ceremony. Considering most Graduations are held over two weeks, and occur twice a year, this is an outstanding donation of time and the University is extremely grateful for this commitment and generosity. What’s involved in volunteering at Graduation? Your role on the day will be to assist in pre-ceremony preparations from ushering guests to assisting the Graduations team. You are welcome to stay on for the ceremony, and we encourage you to join the new graduates and their families after each ceremony for refreshments. You will have a range of time commitment options to choose from, and will also be invited to attend an information session prior to the ceremonies. If you are interested in volunteering at our upcoming Graduation Series in April, please email Ken Wong at ken.wong@mq.edu.au.